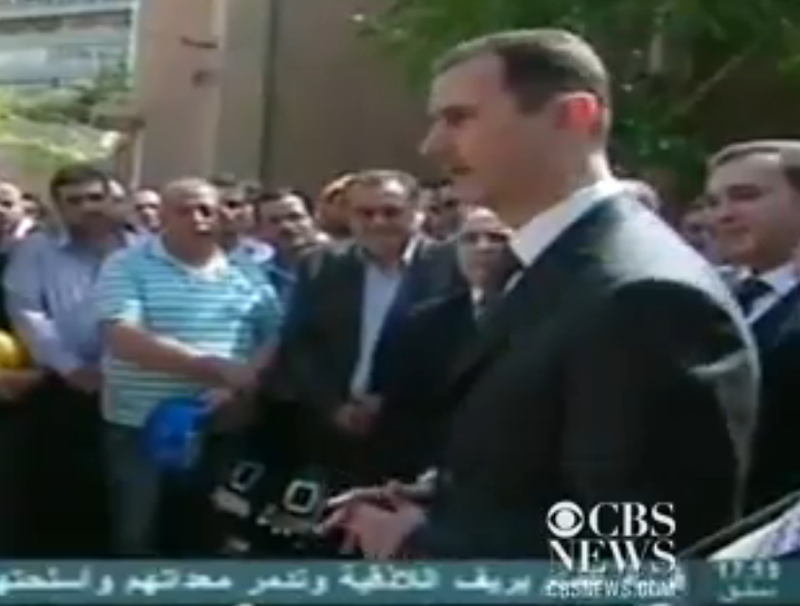 Today Bashar al-Assad made a rare public appearance. In this brief video clip and in the still image below, Syria's Tyrant President displays several low confidence signals consistent with high anxiety and low confidence outside a power plant in Damascus. The President's elbows are constantly held close to his torso. In the context of a leadership role this is a strong signal of lack of confidence and ownership. It is very beta for a male, even effeminate. He has displayed this for some time. He knows his days are numbered. Women leaders should also avoid this tendency when speaking in public or on camera. It is a common configuration used by news reporters. Do not let the constant exposure to this industry specific idiosyncrasy (which should be avoided there as well) alter your interpretation of this body language. Al-Assad's hand gestures (illustrators) are very rapid here - more so than in videos of the previous two years (thus filtering out any cultural or personal tendencies) are also consistent with anxiety. Moreover he constantly returns to his default of holding hands with himself (below with a finger intertwined hold) - more demure, beta and confidence lacking signals. His nonverbals project the emotions of a frightened man, which indeed is and should be.